Sacred Titicaca Lake is part of the Tentative list of Bolivia in order to qualify for inclusion in the World Heritage List. Whatever was missing for me on the Peruvian side of Lake Titicaca was readily there on the Bolivian side. 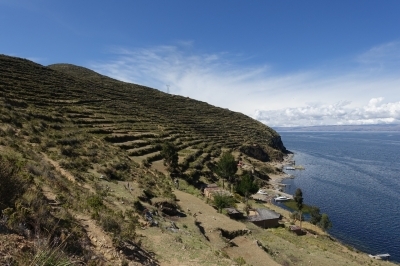 I had boarded a bus from Puno to La Paz with a short tourist stop to visit Isla del Sol. We took a boat ride along the coast line and then landed below an Inka ruin. Due to the limited time window I only hiked along the Southern tip of the island. You reach the main village Yumani after 20min or so on a rather steep and original stone path. With more time, I would have ventured further North where more prominent ruins are found. The Bolivian side of the Titicaca Lake was way more interesting than the Peruvian one. While Copacabana is a fairly touristy place, the Isla del Sol is still relatively quiet and original. The terraces look more authentic with mule manure decorating the trails. Add to this the presence of multiple pre-Columbian ruins and you have a very nice site. Apparently, the Isla de la Luna is similar or even superior in quality. So, I think this is a very nice and well worth inscription. The hub for the Isla del Sol and Isla de la Luna is Copacabana. It's a nice little beach tourist town and well worth visiting. Copacabana is well connected by bus to both La Paz and Puno. As stated you can do a little bit of Isla del Sol as part of the trip between the two, e.g. with Bolivian Hop. If you want to explore the islands in full, you probably have to stay over night in Copacabana or on the islands. The Portugese influenced, cathedral in Copacabana is well worth a visit if you are in town. You can also spend some time on the beach. Tiwanaku is not that far, but may require a cab ride to get to. The toilet situation is fairly difficult. Bring hand sanitizer and tissues. I also wrote a review on the Peruvian nomination. Bolivia is one hour ahead to Peru. Keep the time change in mind when making your travel plans. In a way the Bolivian side is more tourist friendly, as the sunset compared to Puno gets delayed by an hour.